Mercury in the southwestern sky about 45 minutes after local sunset on Dec. 31, 2015. All five bright planets are visible in the sky during this last week of 2015 and into the new year. Here’s a roundup of where to find them and what to look for, along with your best chance to easily spot Comet C/2013 US10 (Catalina) on the first morning of 2016. Mercury is the only bright planet visible in the evening hours. Visible low in the west-southwestern sky about 30 minutes after sunset, the speedy little planet reaches its greatest eastern elongation on Dec. 29 when it’s just a shade less than 20° from the Sun. It’s plenty bright at magnitude -0.6, but you need a clear view down to the horizon to spot the nearest planet to the Sun. The little planet will plunge back towards the horizon during the first two weeks of January. Venus, Saturn, and the star Antares before dawn on Dec. 31, 2015. Venus blazes forth in the early-morning sky through January 2016. At a brilliant magnitude -4.1, it’s the brightest object in the sky except for the Sun and Moon. Venus lies to the east of the claws of the constellation Scorpius and above the red-orange star Antares at the heart of the constellation. The planet shines with a steady white light. In a telescope, you’ll see about 77% of the planet illuminated by the Sun. Mars is much higher and further east than Venus. It shines with a reddish-orange light a few degrees from the bright white star Spica. Both are about first magnitude. Spica may twinkle a little, but Mars will be steadier. There’s not much to see with a telescope. Mars is still too far away, but it will get closer during the next four months on the way to its opposition in May. A wide panorama showing Jupiter, Mars, Venus, and Saturn before dawn on Dec. 31, 2015. Jupiter is furthest east of all the planets in the morning sky. Located just under the rear legs of the constellation Leo, the planet comes close to the waning gibbous Moon on New Year’s Eve. The planet is always worth a look in telescope or binoculars. You’ll see the planet’s four biggest moons doing their gravitational dance from hour to hour and night to night. And while the planet is still a few more months from opposition, it reveals a dazzling array of belts and zones to observers with a good telescope and steady sky. Saturn makes a tidy triangle with Venus and the bright star Antares before dawn. The straw-colored planet presents a fine color contrast with Venus (white) and Antares (deep orange). 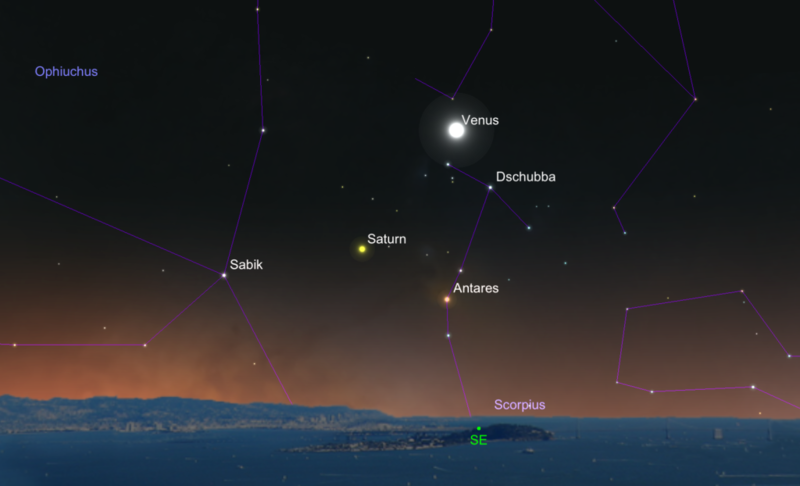 Saturn moves closer to Venus each day enroute to a splendid conjunction on January 9, 2016. Comet C/2013 US10 (Catalina) is by no means a dud, but it did not– and likely will not– get much brighter than 6th magnitude. In images, the planet has a striking “forked” tail and greenish coma, but it has been a little disappointing as a visual object. Still, Catalina, like any visitor from the distant Oort Cloud, is worth examining as it plunges into the inner solar system. You can easily see the comet before sunrise on the first morning of 2016. It’s just 1/2 of a degree from the bright star Arcturus. At this time, it will be visible in the northern and southern hemisphere. As January progresses, the comet will move quickly northward towards the handle of the Big Dipper and sink below the horizon for southern-hemisphere observers (see map above from Sky and Telescope).